The Jewish Community of Korea welcomed its first-ever Torah scroll at the Grand Hyatt Hotel in Seoul on Sunday, The Korea Herald reported. “I’m delighted,” said Rabbi Osher Litzman of the Korean Jewish community. “We have waited a long time for this to happen and now it’s finally here. It’s a big milestone in the development of our Jewish community.” Rabbi Litzman said that he had been planning to bring a Torah to Korea since his arrival in the country four years ago. The Jewish residents of the community helped a scribe from Israel complete the final letters of the scroll. Israeli Ambassador to Korea Tuvia Israeli noted the significance of the Jewish community receiving its first Torah. “If there is any other reason this gathering is important, that’s to show there is Jewish life in Korea,” he said. “Each one of us should be very happy and thankful to live in Korea through this important step. Of course, this will not be finished until we have our own synagogue, but as Rabbi Litzman say, 'This will come,'” Israeli continued. The cover of the new Torah had a picture combining a menorah with Seoul Tower, the latter forming the central candle, the Korean newspaper noted. 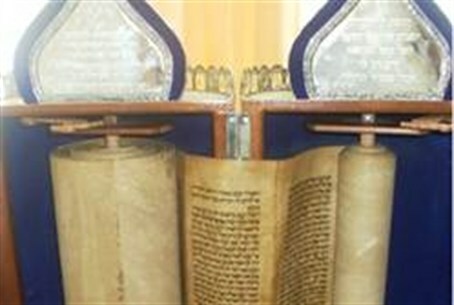 Upon the completion of the scroll, the community paraded the new Torah through the streets to the Chabad Jewish Community Center. Rabbi Litzman, who served in the Israeli army, and his wife Mussia arrived in Seoul in 2008 in order to establish the first Chabad House in South Korea. Prior to their arrival, there were no synagogues in the country and barely any resemblance of Jewish life. At the time, after being asked how he is going to succeed in reviving the Jewish community in the area and pay all necessary expenses, he tilted his eyes skyward and smiled, hoping that with G-d’s help, he would succeed. Now, four years later, it looks like he has.